Castle Hill, on the edge of the city of Brighton & Hove, is a Nature Reserve within the South Downs National Park. The habitat of chalk grassland and mixed scrub has been designated a Site of Special Scientific Interest (SSSI). 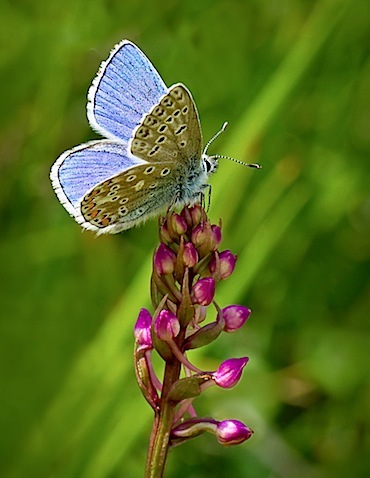 The reserve contains some of the UK’s rarest and most endangered species of flora and fauna including the now uncommon, though widely distributed, Common Blue butterfly. The Adonis Blue, Chalkhill Blue and Small Blue, which is the UK’s smallest butterfly, are also seen here. It can be difficult to identify the different species correctly as there can be wide variations in colour between the species and between males and females. The following URL links to an excellent site for comparing and identifying different British butterflies. It is perhaps easiest to identify the male Adonis Blue with it’s stunning, intense azure-coloured wings – the others tend to have duller blue colouring. 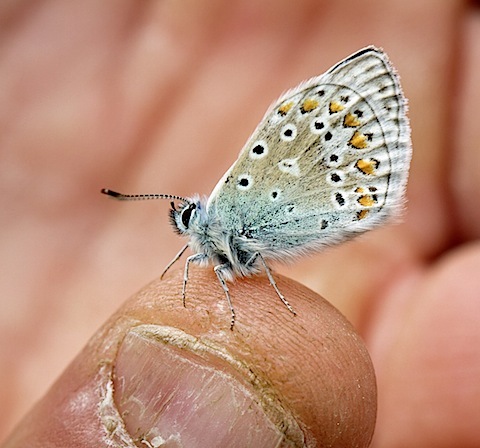 The Common Blue is one of the country’s smallest butterflies with a wing-span of 29-36mm. The image below shows one on Park Ranger Paul Gorringe’s finger tip. 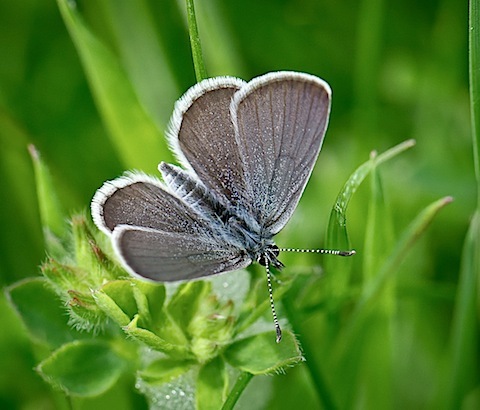 The tiny Small Blue has a wing-span of 18-27mm. The male has greyish-coloured upperside wings with a scattering of blue scales whilst the female is brownish, without the blue scales. The underside of both is a silvery grey. Outside of it’s stronghold in the south of England, colonies exist in isolated pockets often in coastal regions. Sussex is a fortunate to have 45 of the UK’s 59 species of butterflies although some of those such as The Duke of Burgundy, The Purple Emperor and The White Hairstreak are very restricted and seldom seen.